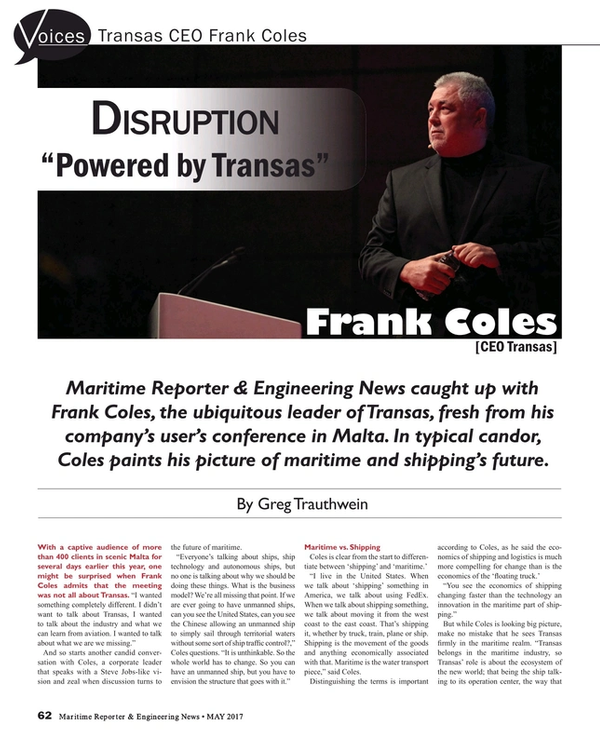 Maritime Reporter & Engineering News caught up with Frank Coles, the ubiquitous leader of Transas, fresh from his company’s user’s conference in Malta. In typical candor, Coles paints his picture of maritime and shipping’s future. And so starts another candid conversation with Coles, a corporate leader that speaks with a Steve Jobs-like vision and zeal when discussion turns to the future of maritime. “I live in the United States. When we talk about ‘shipping’ something in America, we talk about using FedEx. When we talk about shipping something, we talk about moving it from the west coast to the east coast. That’s shipping it, whether by truck, train, plane or ship. Shipping is the movement of the goods and anything economically associated with that. Maritime is the water transport piece,” said Coles. Fleet Operations: I see the largest transformation in terms of fleet operations centers where the ships will be managed in a much more scaled manner from the shore. It’s happing now. Vendor Market: There’s not enough room for all of the Satcom companies, there’s not enough room for all of the vendors that supply applications. Digitalization leads to commoditization; to survive commoditization, you need scale. Consolidation: I see ship management companies becoming large ship management companies. If they innovate, they could be the key components in the digitalized world. The Human Factor: If we can’t find enough people of the right skills, that will speed up automation, that will speed up the use of artificial intelligence and the use of other technologies. While the younger generation is generally viewed as the hinge to driving change, a big wild card in the pace of change remains the regulators. “When a lot of the old guys are gone, change will start to happen much quicker. What I haven’t factored in is whether we can get so far ahead of the regulators, as regulators could be the anchor that drags it all down,” said Coles. “But if Uber and AirBNB can come in and challenge around regulation, there is no reason why the disruptors won’t come in (to maritime) and find a way to challenge the IMO, to challenge the regulators. And while Coles thinks and talks ‘big picture,’ inevitably the conversation comes back to Transas, the company he leads. When asked what Transas will look like in 10 years, he is clear.